The amount of newly generated data keeps growing every day. From about 150 Exabytes in 2005 to almost 1200 Exabytes in 2010, we now create 2.5 quintillion bytes of data every day. Read this again, every day. This is a HUGE amount of data. Just over the last two years, we have generated 90% of all data in the world. And at this pace, by 2020, global data volume is expected to grow up to 44 zettabytes. These numbers drastically affect the way we manage all this data. And, for large enterprises that work with a lot of data, the traditional Document Management software can no longer do the job. At least not effectively. The solution? Artificial Intelligence (AI). The focus of Document Management has never been to simply store and retrieve content. It has always been about helping end users to make sense of all that data, and extract value from it. You’d think that the more data we’d have, we would be able to extract more value from it. But we’re dealing with so much data, that it’s now cluttering our thinking. “The only way we are going to be able to make sense of all this data and to extract more and more value from it is through Machine Learning and Artificial Intelligence. There is simply no other way to keep up with the growing [deluge] of data, as well as the use cases around this content,” says the Box CEO Aaron Levie. The capacity of Machine Learning (ML) algorithms to work better with more data gives Artificial Intelligence the power of making another fundamental shift in the Document Management world. AI and ML are based on algorithms. But unlike traditional data processing systems which are bound to constantly follow the same logic, AI systems get smarter as more data is given to them. They are designed to produce desired results, to find trends, patterns, and provide predictions in complex analytical tasks. This ability of AI and ML to learn from a large amount of data allows us to finally accomplish managing and controlling large volumes of content. As such, they promise to permanently change how we do Document Management. “I think it’s going to be more fundamental than the Cloud in terms of its impact across all enterprise software, but specifically in our space, Cloud Content Management”. So far, AI and ML have made significant changes in the way we manage data. And AI doesn’t stop there. It evolves every day, and so does the world of Document Management. Let’s zoom in on these changes. In the last few years, using AI, Machine Learning and Big Data greatly changed the world of Document Management. The long-awaited expectation that AI and ML would be able to reduce the workload and free up enterprises to handle other duties are now closer to reality than many of us realize. Data Classification. 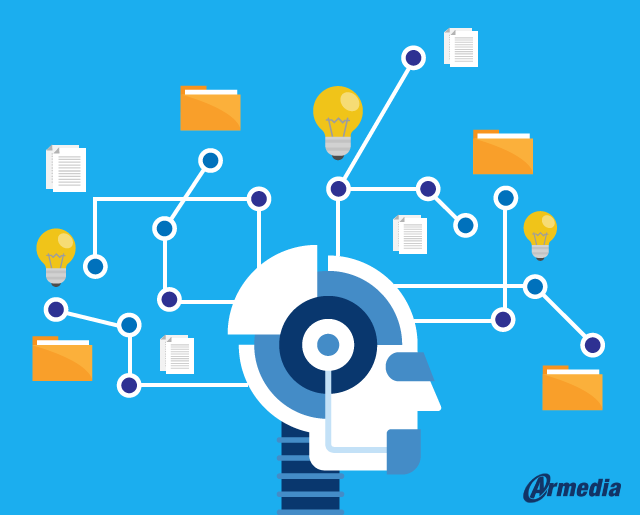 Unlike traditional Document Management systems, thanks to ML, AI-based systems are capable of reading documents, analyzing their content, and accordingly classifying them. What’s more, AI systems make all of this possible in a fraction of a second, saving your employees hours, and saving your organization a lot of money. Reliable Digitization. Thanks to AI and Optical Character Recognition (OCR) technologies, we can reliably let machines do all the post-scanning character recognition with almost no human intervention. With enough data for Machine Learning to get useful, organizations can automate the OCR and quality assurance based on a previous small sample of training materials. After the OCR system is trained well, it can recognize large number of scanned documents with human-level accuracy. Data Extraction & Document Clustering. One of the most impressive abilities of ML is Data Analytics. We can now let computers extract data from documents without any human effort. Thanks to ML, AI is able to accurately read information, understand the context, and extract data. This ability of AI-based Document Management systems to read and understand the context of data allows for better decision-making. Also, with this feature, AI-based Document Management systems can easily cluster similar documents without ongoing human intervention. Both data extraction and document clustering are time-savers that traditional Document Management systems cannot provide. Data Analysis. 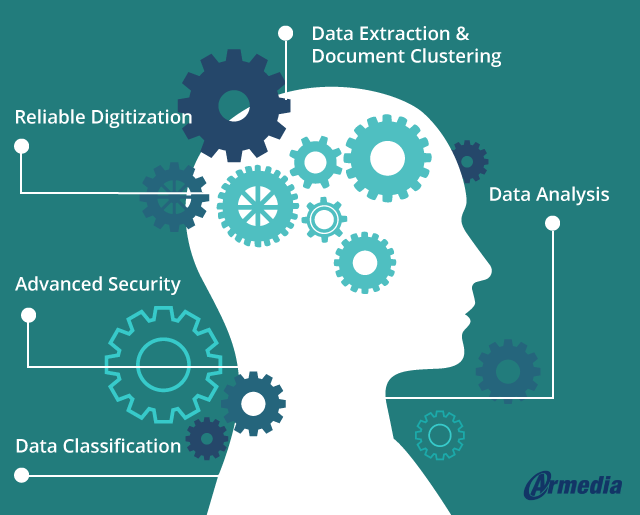 Data Analysis, Predictive Analytics, and Business Intelligence are also easier with an AI-based Document Management system. 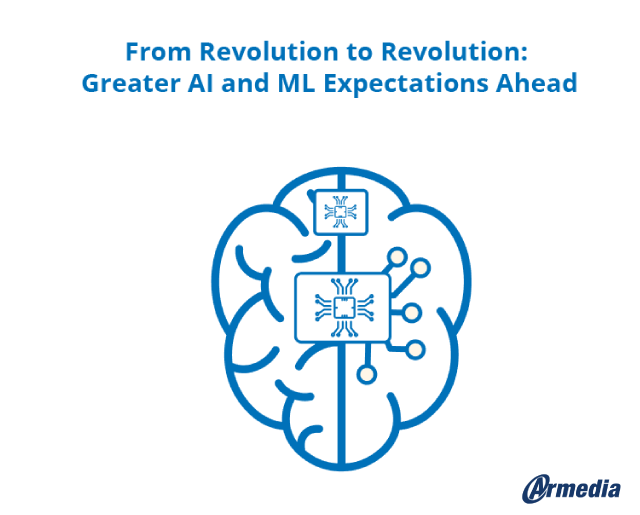 From Data Discovery to Real-Time Analytics and visualizing trends and predictions, AI-powered systems can help companies analyze historical data and predict what can happen based on that data. Without AI, these analyses would be much more difficult and less reliable. Advanced Security. AI-based Document Management systems use accurate and efficient techniques to detect personally identifiable information (PII) and sensitive information, and protect it when needed. AI can very easily identify which employee has access to which documents and prevents any kind of unauthorized access, edits, or alterations. Machine Learning and Deep Learning can detect unusual activities and patterns, including the movement of data packets. This means that AI can protect documents by safeguarding the files themselves, and with it, further improve security alongside whitelists, blacklists, and firewalls. This sofar was a historical overview. Great things happened thanks to AI and ML. But greater things are still to come. Read on to see why I believe this to be true. We have already witnessed many innovative solutions based on AI technologies. When it comes to managing extensive amounts of documents, the 5 use cases we’ve mentioned above have significantly improved the way traditional Document Management worked. But AI doesn’t stop there. There are many other innovative solutions that are not yet implemented in Document Management (or remain just an idea) but can significantly contribute to its effectiveness. 1. What about AI talking to other AIs? Right now, AIs tend to be set up within relatively closed environments. What if they could talk to one another? What if we’d have two previously isolated AI systems that work with unrelated data, and get them to talk to one another? How would this dialogue look like, and what are all the benefits we’d be able to extract from seemingly unrelated pools of data? This could eventually lead to new scientific discoveries, improved workflows in transportation systems, streamlined in-company processes and so on. 2. What if you could speak to your computer as if it is a person? This innovation is, in fact, well known to the world through Siri, Alexa, and similar Virtual Assistants powered by AI. But, wouldn’t it be useful to the Document Management world if people could have Virtual Assistants that can help them in their work? Instead of searching for a specific keyword or phrase, what would it be like if you could just tell the computer what is it exactly that you want, and the computer provides it without any extra input on your part? Simple questions like “Computer, fetch me a list of the Top 10 employees in our R&D Department” would perform a set of evaluations based on recorded performance, HR data, employee timesheets and so on. Things that would take the HR department hours to assemble, could be done with AI in just minutes. Sounds very interesting and useful. This way your employees could save hours otherwise spent on searching and analyzing data. 3. What if AI goes through your documents for you? The future of AI also promises to grant your PA a voice. You can just say “give me a 1-minute summary of Report B,” and listen as a fluent, clear voice recites the relevant text. The key passages would be identified by an algorithm, and the one-minute summary would be a machine-generated text that may not even exist as an actual text on the document. It’s definitely something with wide potential. And if you make a little research, you will find much more examples that could blow your mind. And believe me, many of them can come true much faster than you could think. Actually, AI is so progressive that I wouldn’t be surprised if some of these ideas are already built by a young, energetic team of engineers somewhere in the world. You just need to be open to new solutions and give your enterprise the competitive advantage that you work to achieve. In the last few years, AI has revolutionized the way in which organizations store, archive, and extract information. And, as we witness the accelerated development of AI in this field, we can only imagine how our industry will be transformed by it. If you thought we have invented all we could possibly think of, think again. Change is inevitable even in The Document Management industry. Companies are always working toward new inspiring advancements, and Artificial Intelligence and Machine Learning are currently at the cutting edge of innovations in the industry. I often times feel like we’re at the start of a very bright technological revolution. And those who recognize it, are the ones that will be around for the long haul. Because let’s face it: 44 zettabytes of data. And it seems we’re only warming up. There’s no way traditional Document Management software could ever handle all that new data. If you have any thoughts about this topic, please share them in the comments section below. If you have any questions, feel free to contact us. And please do not forget to share this blog post on your social media profiles so more of your colleagues could understand the importance of AI and ML in Document Management.